Have you done a search for local flexible or part-time jobs lately? If like me you scan the local job sites every now hoping that your dream job – challenging, interesting, genuinely flexible – might have miraculously appeared, you’ll know just how far we are from that dream job ever being a reality. Truly flexible work is still a pipe dream for all but a few. And most of the part-time jobs I see advertised are either low-paid and unskilled or in the case of receptionist and admin jobs also still require you to be a bum on a seat between the hours of nine and five. To find a job in line with my experience means commuting to a full-time job in London but that would mean never being able to do the school-run or pick up. My daugther’s school doesn’t provide before and after care [yes it’s stuck in a 70s time warp], and it’s not fair to ask my 73 year old mum to pick up the slack. So I’d have to fork out for a childminder. Besides my daughter wants ME there, not a stranger. I want to be there too. She’s only going to be little for such a short time and I don’t want her childhood to pass me by in a blur of rushing her to a childminder, commuting, rushing home and rushing her to bed. I’m a single mother by choice, so there’s no other parent to show up to her nativity plays or sports days if I can’t. What’s more, I want to do fulfilling, challenging work that makes me feel like I’ve achieved something at the end of my working day. But I want to do it on my own terms. Technology means we can work when we want, from wherever we want. But most of today’s employers aren’t on board with this concept yet. So until employers catch up and things change for the better what’s the answer? Be your own boss. Work for yourself. Join the self-employment movement. 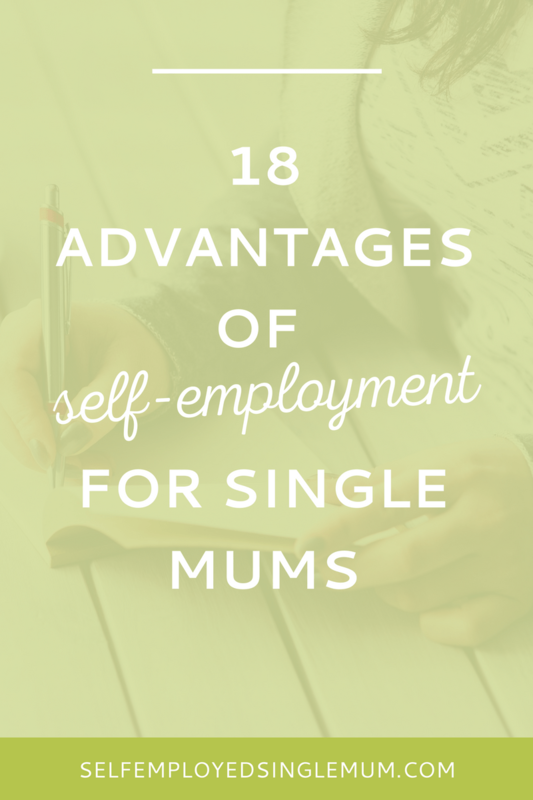 Having been self-employed for the last year and a half I firmly believe that the many upsides of being your own boss make self-employment a no-brainer for single mums. Not convinced? Well I’m not the only one who thinks so. The recent rise in the number of female entrepreneurs [don’t utter the term ‘mumpreneur’ in my earshot!] is a direct response to the fact so many women feel that the current job market doesn’t work for them. You get to do something challenging and rewarding that you LOVE. And you get to do it on your own terms. You work the hours that suit you. You set your hours so you can fit in the school drop-off before opening up your laptop and be back at the school gates again at 3pm. Want to work less in the school holidays? Done. It’s up to you and no-one else. You’ll challenge yourself and learn more in a months than you learnt in decades as an employee. No more being held back by the limitation of a role you only accepted because it was the only part-time job you can find. You can pick and choose who you work with. Sick of colleagues who sigh and call you ‘part-timer’ when you race of of the office at 5pm to make it to the childminder? Tired of the nightmare boss who makes your life a misery? So long suckers! Now I only work with people who respect me – both my professional contribution AND my commitment to be there for my daughter. And it’s not just the minor emergencies you can handle without ruffling a feather. Need to get your hair done? Overdue a trip to the dentist? Get it all done when it at your convenience without worrying that your employer is watching the clock. Oh and you can also avoid the crowds and fit in your retail therapy midweek when the shops are blissfully empty. I spent a Thursday morning hitting the shops at Bluewater last week and then treated myself to lunch at Jamie’s Italian. Thank you very much flexible self-employed working life! No need to book time off work to wait in for the boiler man, and you’ll be at home to accept all those deliveries. No more Saturday morning queueing at your local sorting office collecting mail. School plays, sports days, reading with your kid’s class? Count yourself in – no questions asked. Cut the cost and the time of commuting from hours a day to just minutes! Your commute is as long as it takes you to walk from your front door to your home office/dining table/couch! Talking of home office, you get to make your work space entirely your own. Want to play heavy metal? Your call! Want to create a cosy space for reading inspiring business books? Do it! Want to paint your nails at your desk? [Tip: I find this the best time for un-smudged nails. Plenty of drying time] Not a problem! Work wherever you want. Need a change of scenery? When you get bored of staring at the same four walls you can change things up by spending the morning working in your favourite cafe. I’ve also worked from a holiday cottage in Sussex, a gite in France, and a couple of spas. Talking of spas – you can get in on the ‘spa-day-away-day’ action. A couple of female entrepreneurs I know gave me the idea of booking quarterly planning days at a spa. I find a great deal on Groupon, take my laptop, a notebook and get my planning head on away from the usual day to day stuff, while enjoying a pedicure and a session in the steam room. This reason alone should be enough to convince you! Wave bye bye to childcare costs, and stressing out because the train’s spent the last 10 minutes stuck in a tunnel and you’re not going to make it to the childminder’s before 6pm. Less plate spinning, more quality time with your kids. We single mums have so much on our plates. So just quit trying to do it all. With only your kids to get ready in the morning – it doesn’t matter what you’re wearing – it’s easier to get out of the house, and you have all that time after school to hang out, make dinner and just be. Halve your clothing budget – and your laundry load. I’ve got a few smart outfits for when I have meetings with clients, but otherwise I’m in jeans, plimsolls and a sweater day after day. Want to work in the same clothes for three days on the trot? Who cares! Earn more in less time. I’m not going to lie, self-employment is hard work at first but once you’ve got yourself set up you really can make money than you did when you were employed in fewer hours. In fact, there’s no limit on your earnings. As an employee you’ll only ever earn what your employer is willing to pay for the job you do. When you’re self-employed, the sky’s the limit. Be an amazing role model for your kids. Little eyes are watching you and I hope I’m setting a great example for my daugther of what’s possible if you work hard and refuse to live according to anyone’s expectations except you own. So there you have it. I think that’s a pretty convincing list don’t you? If you’re already self-employed have I missed anything? I’d love to hear from you – what do you think the advanatges of self-employment are? Tell me. Leave a comment. Let’s chat!